This ramp connects the Greenbush Link to the East Campus Mall at the University of Wisconsin. Signs along the trail help users navigate the trail system. The "Greenbush Link" is a 1-mile segment of the Southwest Path in Madison, Wisconsin (Dane County). The Southwest Path is 5.6 miles in length and is the northern reach of the Badger State Trail, a 40-mile trail that connects Madison to Freeport, Illinois. In 2002, Wisconsin Department of Transportation awarded the City of Madison a $1.46 million TE grant to construct the Greenbush Link portion of the trail, which had become known as the "missing link." Completion of this "missing link" in 2006 closed the 18-mile loop around central Madison and along the Nine Springs E-Way. 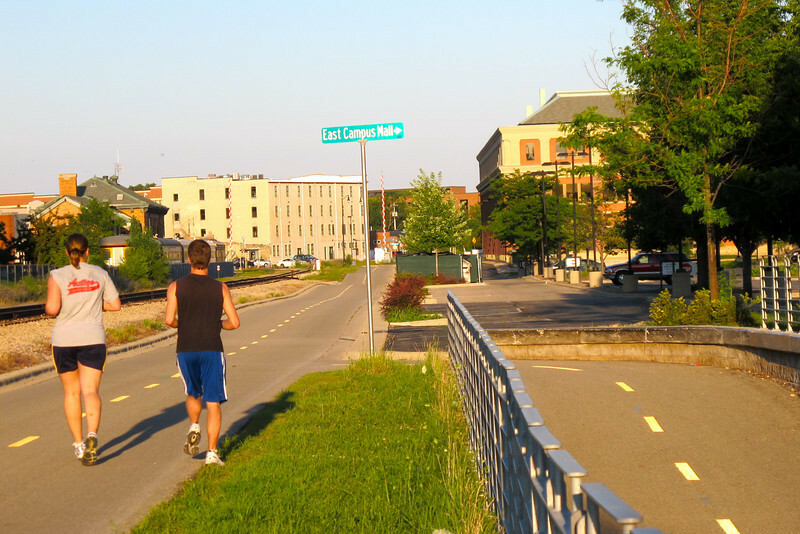 It also connects the Southwest Commuter Path with the Isthmus Bike Path and the Capital City Trail as well as regional trails such as the Military Ridge State Trail. This 1-mile corridor in downtown Madison was very difficult for the Madison Department of Transportation to assemble due to physical constraints and property ownership challenges. Ultimately, the city pieced together a corridor that involves rails-with-trails, easements from the University of Wisconsin and private properties, renegotiation of leases with three commercial property owners, two new crossings of active rail line, and other miscellaneous property agreements. Extensive retaining walls built as well as a new bridge over an arterial street were constructed. The total cost of the construction was approximately $3 million. Land costs added approximately $400,000 to the final price tag.